New DC Publisher Jenette Kahn wasn’t a big fan of the many reprint titles that DC was publishing at the point of her arrival, and on her new watch, they began to be fazed out in favor of new material. This shift in priorities first manifested itself to me in the pages of SUPER-TEAM FAMILY. Previously, this had been a grab-bag series of super hero team-up stories of the past, and a regular purchase of mine. But beginning with this eighth issue, the lead berth in the magazine was handed over to new adventures of the Challengers of the Unknown. The Challs had a long and storied history. 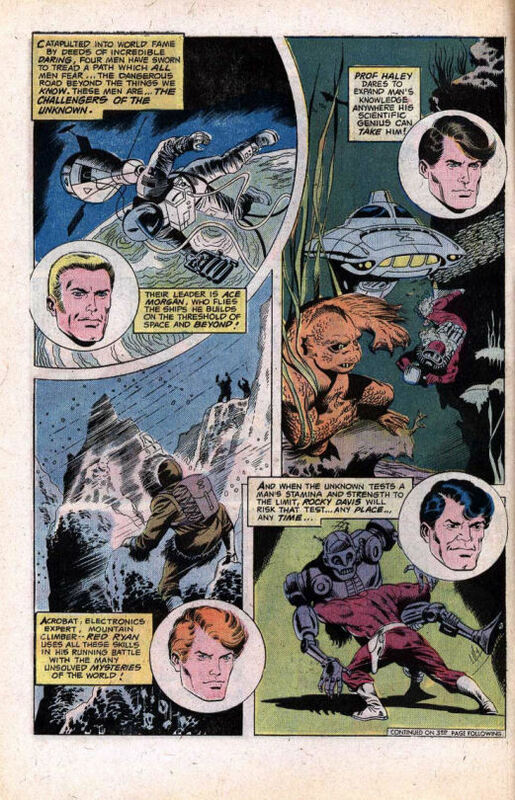 First created by Joe Simon and Jack Kirby in the final days of their partnership, the book had run for a decade and a half before wrapping up as the 1970s got under way, having straddled several genres along the way. It was an adventure comic, a faux-super hero comic, and a horror comic at different points in its run. Te underlying concept of four specialists who survived a plane crash and dedicated their skills to encountering the strange and unexpected because they were all now living on borrowed time anyway held true throughout the run. 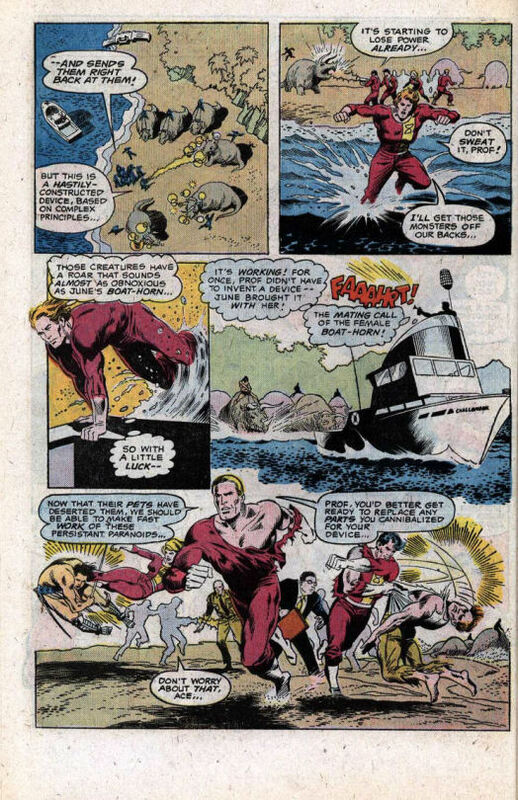 At this particular moment, the Challengers were being handled as an adventure comic with some super hero overtones–their uniforms, for a start. This was the period where there was a lot of interest in the unknown and supernatural in the media. IN SEARCH OF was a popular television program, and films about the hunt for Bigfoot had begun to crop up like weeds. Tapping into that, this first new Challengers story had the team dispatched by then-president Gerald Ford into the Bermuda Triangle–an area of fascination in this period–to rescue Dr. Henry Kissinger, whose plane has gone missing therein. As a kid, I didn’t really know who Kissinger was, so the attempt at real-world relevance flew over my head. This was a pretty standard by-the-numbers outing for the team. They entered the Triangle, found themselves and Kissinger on an island vibrating just out of synch with reality, battled tribesmen and mammoths, and eventually made their escape and way back to civilization. I enjoyed it well enough, but it wasn’t my go-to for entertainment. 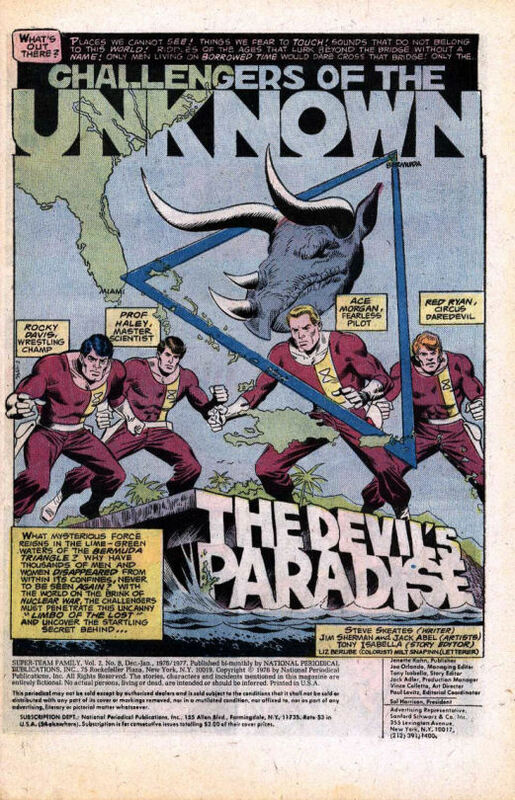 No, the reason I was here was for the Doom Patrol, whom I had met in the previous issue. This strange quartet of freaks captured my interest immediately, and I wanted to know more about them. 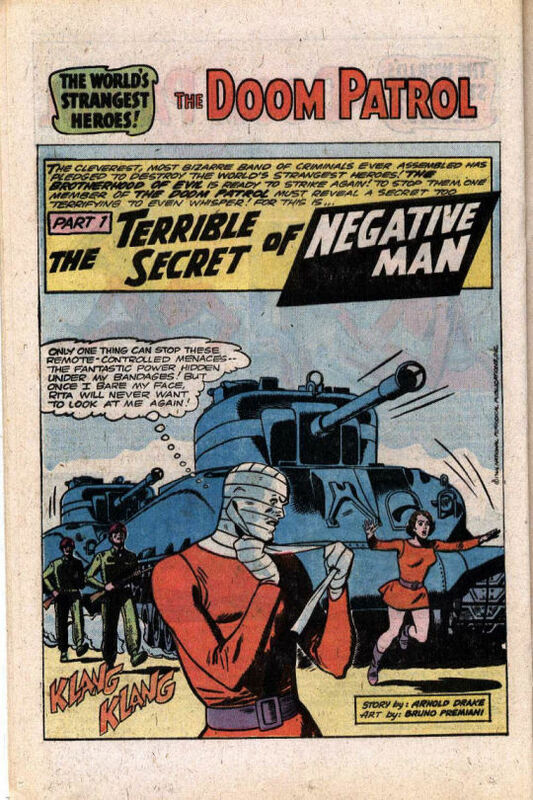 As it turned out, this story would give me the full lowdown on Larry Trainor, Negative Man–but it would also put me off of the group a little bit. 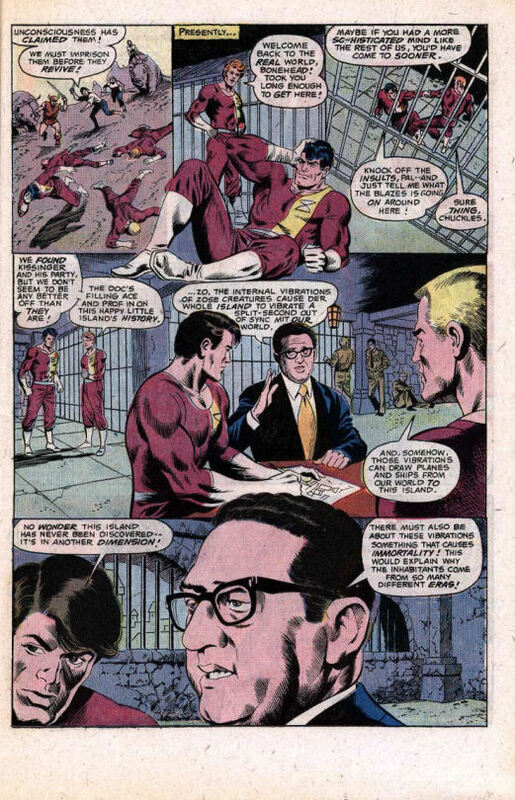 The story is a follow-up to the one presented in the previous SUPER-TEAM FAMILY issue. Once again, the Brotherhood of Evil has designs they want to play out across the world, but to do so they need the help of Negative Man. To enlist his aid, Madame Rouge poses as Mademouiselle Soulette, whom the team rescues from a crashing plane. 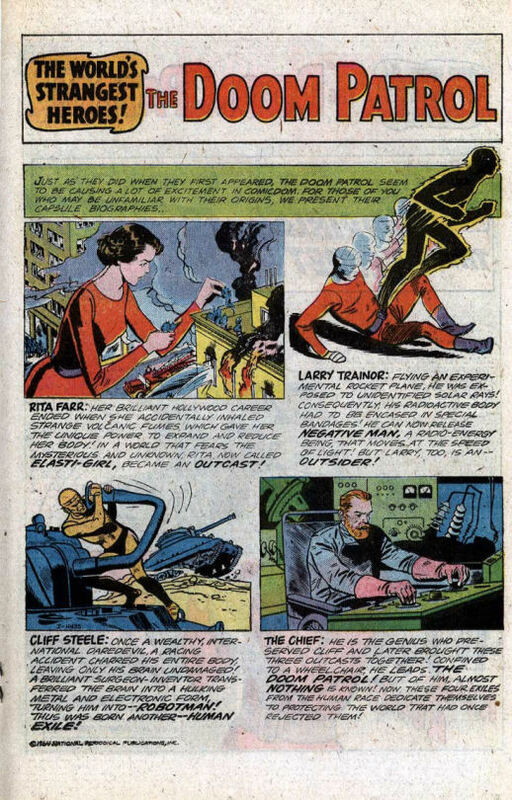 Playing up to Larry and engendering the jealousy of Rita, Rouge convinces Negative Man to take photographs within a sealed time capsule, which actually contain the plans for a super-weapon the Brotherhood desires. The weapon is a ray that the Brain can use to enlarge toy weapons, turning them into dangerous threat. But the Chief has been on to this ruse the whole time, but to defeat the Brotherhood, Larry must do what he hasn’t done before–take off his bandages and expose his radioactive body, to jam the Brain’s remote control. 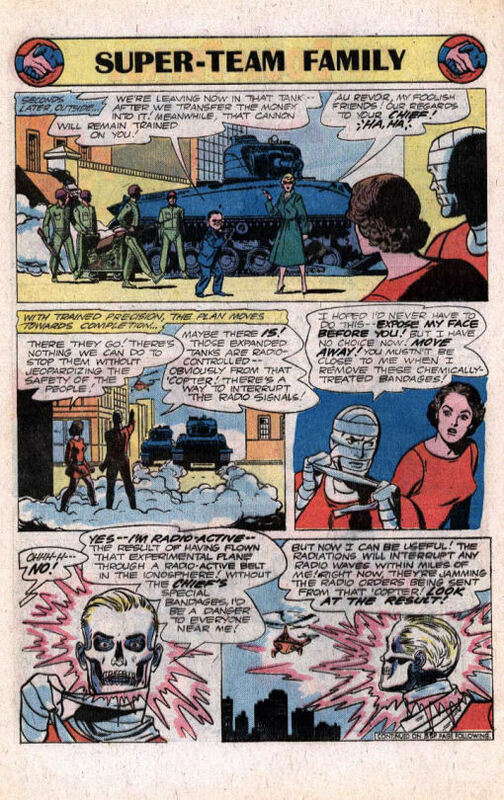 And this image of Negative Man’s see-through skull-face really creeped me out when I first saw it, so much so that I kind of didn’t want to look at this sequence of pages again when rereading the story later on. It was this that so unsettled me that it made me wary of Doom Patrol stories in the immediate future–enough so that this was the last issue of SUPER-TEAM FAMILY that I bought while the DP reprints were still running.